Some of my favorite items to test out are bath and body items. I mean, these are the real "workhorses" in your beauty arsenal...products that you use every day! Generally I go for products that are gentle on the skin. I also like products to have a nice scent (without being "overly" scented) and a good price. 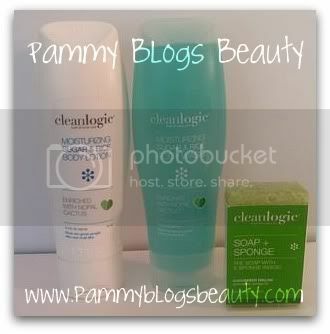 For this review I tested out the following items from Cleanlogic Bath & Body Care: Moisturizing Sugar & Rice Body Lotion, Moisturizing Sugar & Rice Body Wash, Cucumber Melon Soap + Sponge, Exfoliating Dual Texture Body Scrubber, Exfoliating Bath Gloves, and the Stretch Bath & Shower Cloth. Cleanlogic's philosophy is founded in, well, logic! This lines focus is body care items that leave your skin clean and nourished. At the core of Cleanlogic's collection is a large variety of body buffers, soaps, and lotion. What else is cool about this company? Well, Cleanlogic prints Braille on all its products and packaging! It is the first Bath and Body Care line to do so! Also, Cleanlogic created the Inspiration Foundation which is a non-profit organization designed to empower disabled individuals to live more independently. Anti-Microbial Bath Accessories: They resist mold and bacteria! All the body buffers and bath accessories are treated with an antimicrobial agent which discourages the growth of bacterias and molds. We all know that showers are a breeding ground for that sort of thing! Talk about logic! This is really a genius idea...and it works! 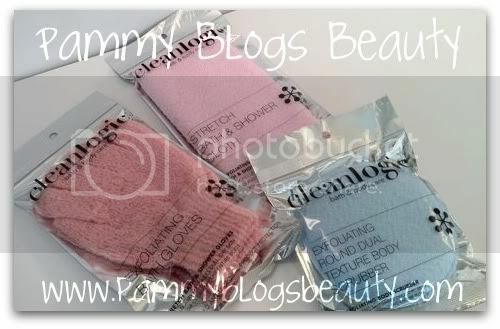 My Cleanlogic buffers and cloths all smell fresh with absolutely no sign of mold! What a nice switch from typical body poufs which are mold magnets! I love this little sponge! This provides such an ideal prep for self-tanning! The blue textured side exfoliates so well! I just squeeze out a little bit of the body wash onto the sponge and concentrate the blue side use on body parts that need deeper exfoliation. The exfoliation is stimulating for your skin and feels very invigorating! The packaging states that it can help stimulate blood circulation and helps control cellulite. For the rest of the body I use the white terry-cloth side. This sponge is just the perfect size to fit in your hand. Plus the ribbon/handle is nice for hanging it on a hook in the shower to dry. Plus the anti-microbial ingredients in this sponge have made it mold and stain resistant! Love it! And, only $2.49! I have been using this sponge for weeks and it is still going strong! What a unique item! It is like a super long and stretchy exfoliating "wash cloth". The size is nice as you can grip it and stretch it (up to 3x its size) to cleanse and exfoliate your back. It has a dual layer and a ribbon "hook" that you can use to hang it up in the shower. The "scrub" is actually embedded into the weave of the product. The stretch fibers create a "loop-to-loop" exfoliating texture. Embedded with Cleanlogic's anti-microbial protection. Fabulously priced at $4.99. I love using these gloves for pre-tan exfoliation or anytime I want just really good exfoliation. 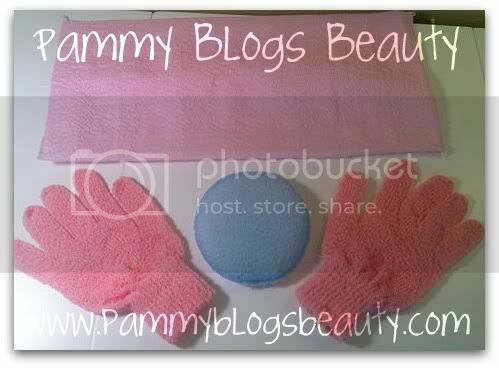 If you have never tried exfoliating gloves before then you are missing out! You just slip one on your hand and then apply shower gel or bar soap to the glove. Then just smooth over your body. Voila! Such easy exfoliation. These gloves are made of the same textured fabric that the Body Cloth is made out of: the "loop-to-loop" exfoliating stretch fabric. What else is nice? You get 2 gloves in a pack. I never use both gloves at the same time. So, you have a back up! $2.99 for a pair. This is so cool! A glycerin soap and exfoliating sponge in one! Essentially this is a sponge that has been "soaked" in soap...and then the soap hardened and formed around the sponge. I love inventive products! I honestly have never seen a product quite like this! As much as I love using body washes, I am a bar-soap girl at heart. This Soap + Sponge allows you to just run this bar along your body to get the benefits of both the soap and the exfoliating sponge. 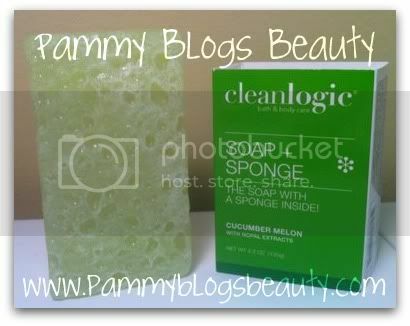 I tried out the Cucumber Melon scent which is just divine. As I have been sitting here typing this, I have smelled it at least 5 times. Yummy!!! Priced at $4.79. These lotions and body washes are enriched with the Nopal cacti. This plant is known for its healing properties, antioxidants, and anti-inflammatory action. It can help balance and moisturize your skin. These contain natural ingredients and are paraben-free. I find the scent to be very soothing. It is very light and reminiscent of baby lotion. The body wash lathers well and rinses clean. My husband loves this body wash too! The body lotion is nicely moisturizing without a sticky feel. It absorbs well and leaves you nicely moisturized and freshly scented! What a great line by Cleanlogic! The soaps and lotions smell lovely and the bath accessories work great! I especially love that the bath sponges have anti-microbial properties!